Florida 281 was originally sign-posted along Avalon Boulevard from Interstate 10 north to U.S. 90 at Pea Ridge. 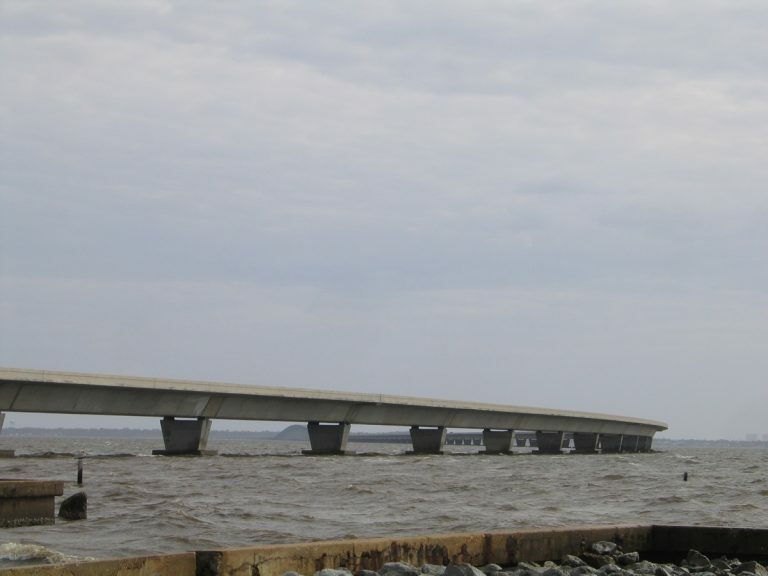 The route was extended south when the bridge across Santa Rosa Sound between Garcon Point and Redfish Point near Oriole Beach opened on May 14, 1999. The $95-million span is tolled, leading to the designation of SR 281 south of Interstate 10 as Florida Toll 281. It took the new bridge and extension of Florida 281 to prompt new guide signs reflecting the SR 281 designation on Interstate 10 related guide signs. Previously panels referred to "Avalon Boulevard" only. Spreading into this view northwest of Redfish Cove is the Garcon Point Bridge. Sweeping curves are a part of the 18,425 feet bridge span, which elevates to a height of 65.6 feet. Photo taken February 9, 2006. The $95-million two-lane bridge links U.S. 98 in southern Santa Rosa County with Interstate 10 near Milton. The purpose of the bridge is two fold: to alleviate growing traffic concerns along the Three Mile Bridge (U.S. 98) across Pensacola Bay and to facilitate hurricane evacuation traffic to Interstate 10 and points northward. The bridge is tolled at a rate of $3.75 per passenger vehicle, with fees collected at a five-lane toll plaza just north of Garcon Point. The toll collection facility includes two dedicated lanes for SunPass that allow account holders to proceed through the plaza at 25 mph. Planned since 1984 the bridge was initially nicknamed "Bo's Bridge" after former House speaker Bolley "Bo" Johnson, a Milton Democrat and landowner in the Garcon Point area, who supported the bridge with legislation to form the Santa Rosa Bridge Bay Authority and who also circumvented state rules to get the authority a $8.5-million startup loan. Construction on the bridge took just 29 months, but with destruction of area wetlands and illegal dumping of concrete and other waste into the bay, leading to a $4-million in fines and restitution paid by the contractor that built the span, Odebrecht-Metric. The bridge authority would foot the bill for the environmental damage and Johnson would be convicted of tax evasion in an unrelated case the same week the new bridge opened.2. 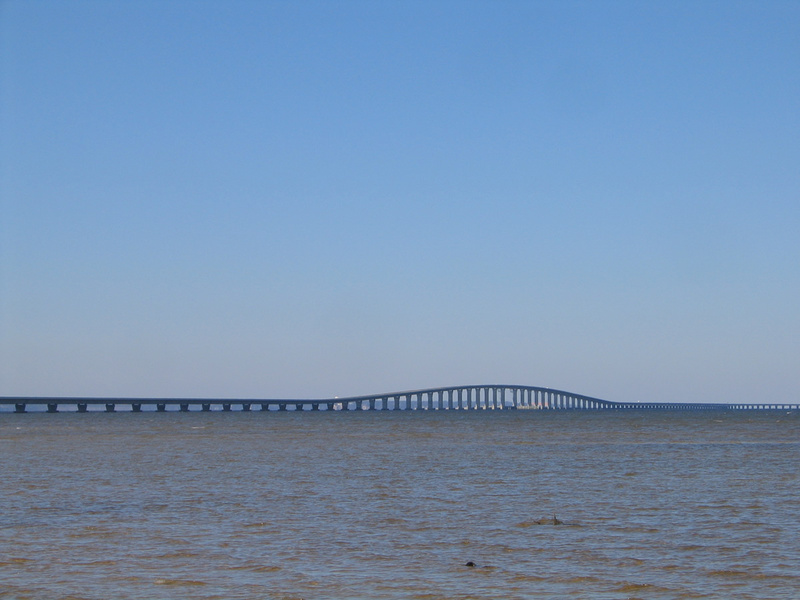 The northernmost extent of the Garcon Point Bridge curves southwesterly initially from just east of Hernandez Point for the trek across Pensacola Bay. Waters reach a depth of 24 feet at the navigation hump of the 40-foot wide bridge. Photo taken February 6, 2006. Bo's Bridge was officially named the Garcon Point Bridge in March 1998. This name was selected over another proposal, the Santa Rosa Bay Bridge.3 Tolls on the bridge have been suspended during hurricanes to aid in evacuation and also due to other emergency detours, such as the closure of State Road 87 due to wildfires. This was the case in the time leading up to the September 15, 2004 landfall of Hurricane Ivan and until October 9, 2004 when Interstate 10 was restored to service across Escambia Bay.4 Another suspension of tolls occurred on August 27 and 28, 2012 due to the potential landfall of Hurricane Isaac. Garcon Point Road remains in service just west of Florida 281 to Hernandez Point. The road serves a handful of homes before ending at Garcon Point Park. Photo taken 02/06/06. A boat ramp lies at Garcon Point Park at the end of Garcon Point Road, just east of the Garcon Point Bridge. Condominium towers from the Portofino complex on Pensacola Beach appear on the horizon. Photo taken 02/06/06. Looking west from Garcon Point Park at Emanuel Point, where the waters of Escambia and Pensacola Bay meet. Photo taken 02/06/06. Garcon Point Road northbound as it leaves Garcon Point Park. The local road was a part of Santa Rosa County 191 before State Road 281 was constructed to its east. Photo taken 02/06/06. Redfish Point Road spurs north from U.S. 98 (Gulf Breeze Parkway) to Pensacola Bay by Redfish Cove. Florida 281 passes over the local road at this overpass. Photo taken 02/09/06. Redfish Point Road ends abruptly at the waters of Pensacola Bay within view of the Garcon Point Bridge. Photo taken 02/09/06. "Two Down, Two to Go on Avalon Boulevard Multilane Projects." Santa Rosa's Press Gazette, May 1, 2013. "How a Bridge Went Broke." St. Petersburg Times, July 11, 2011. 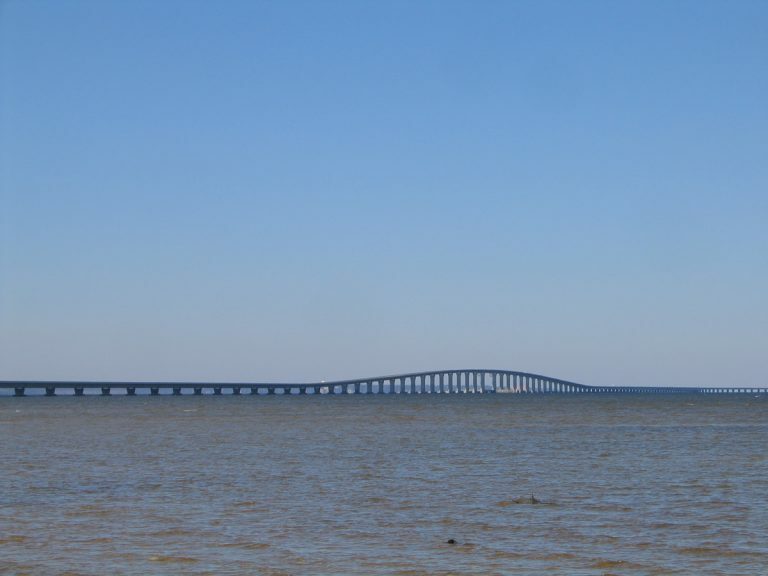 "New Span over Pensacola Bay is Named Garcon Point Bridge." Miami Herald, The, March 3, 1998. "Garcon Point Bridge toll restored." Pensacola News Journal, October 9, 2004.